These days, conflicts in tennis are so commonplace that they seem to be taken for granted. It is true that the tennis world, particularly in the US, is a small group where the interrelationships read more like a flow chart of a soap opera than real soap operas do. After all, just taking the ESPN media team, Brad Gilbert has coached a number of top players, including one of today’s finalists — Andy Murray, and veteran coaches like Darren Cahill and Paul Annacone also have myriad connections to the players whose matches they call (or at least the opponents of the ones on the screen). It’s always been a tricky line, and some broadcasters (Annacone, Cahill) have the natural discretion and temperament to toe it well, while others are less successful. 1. He has a financial/reputational interest in the outcome of the match. Even if McEnroe isn’t promised any sort of financial incentive for Raonic’s performance this fortnight, he stands to gain a reputation as a grass court guru if Raonic wins. In fact, just by having Raonic reach the final, McEnroe can claim some credit for his tutelage of the Canadian (though some might argue that Milos was already going in that direction pre-McEnroe). It is extremely difficult to take McEnroe’s comments at face value, knowing that he has a vested interest in the outcome of each point. Moreover, hearing him parrot the Raonic game plan skews the commentary towards Raonic, and away from Murray’s performance. 2. Not all bias is the same. Broadcasters are no different than you and I — they enjoy the sport, and they have favorites. If you asked any group of tennis fans, they’d probably have opinions as to which broadcasters are Federer fans, and which prefer Nadal. And, for example, American broadcasters tend to root for American players, whether it be Madison Keys or Sam Querrey. This type of bias is part of the game and part of having individuals with their own opinions participate in the coverage. But, just because we allow a certain level of opinion to be a natural part of the coverage (annoying though it may be), doesn’t mean that we have to allow this level of conflict. 3. Milos Raonic Tennis should have more power. Milos Raonic puts a lot of weight in his control over his tennis career, and has referred to it almost in a corporate sense, as Milos Raonic Tennis. But, the fact of the matter is that Raonic does not have the juice to really make McEnroe change his other commitments or behavior. McEnroe is likely the biggest broadcast star ever produced by tennis — he is a genuine celebrity in a way that no other current or former pro is. So, his broadcasting responsibilities were never going to change. And while Raonic may have been well advised to consult with him, McEnroe’s media commitments should have kept Raonic from retaining him full time. Raonic may not care that McEnroe is broadcasting his coaching on two networks, but he should. There’s a reason that players are reticent about discussing their match strategies in detail. Developing a strategy against opponents is an important part of today’s game, and while it’s not exactly rocket science what a player will try to do, there are nuances that should be kept within the team for use over the longer term. Moreover, whether or not he chooses to acknowledge it, it’s just a big distraction for Raonic at a time where he needs to keep those to a minimum. Compare this to Djokovic-Becker: while pre-Novak, Becker’s social media was the source of much entertainment (and so many retweeted compliments about Boris), since Boris has joined the Djokovic team, he’s become much more circumspect, which is no doubt due to Djokovic’s influence. It helps Djokovic to benefit from Becker’s contributions, without having to worry about what public statements will be made to take away from the team’s goals. 4. Other players should care about how they are being presented. Commentators are a significant source of information for tennis viewers. The opinions proffered by the talking heads does affect how a player is perceived — whether it’s talk of Serena’s battles with nerves, or Sharapova’s love of competition, or Berdych’s tendency to get tight in matches. Sure, some of this is visible without the broadcasters’ opinions, but the media has a unique role in shaping the narratives that come out of a match. If I’m Andy Murray today, I would like the match call to reflect my work and role in the sport as much as, or even more than Raonic’s. 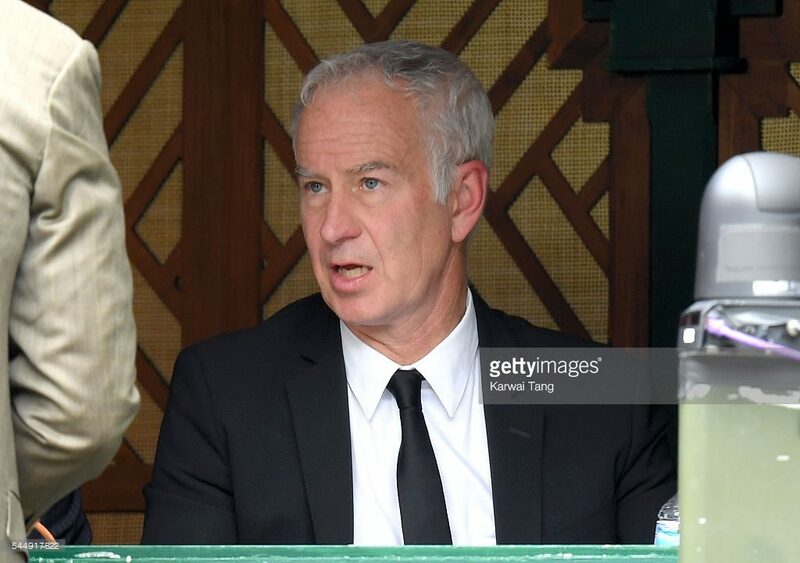 McEnroe’s presence in the booth necessarily shifts the focus. Perhaps Raonic errors don’t get as much scrutiny, and Murray winners are seen through the lens of what Raonic didn’t do rather than what Murray did. Again, different presenters will have different opinions, but it’s hard to take McEnroe at face value, given his conflict here. 5. McEnroe isn’t helping himself. People may have their complaints about John McEnroe as a commentator, but he is an engaging and interesting presenter. He is one of the few truly great players who has managed to avoid the awkwardness that can plague other former players in the booth. The same personality that made him a star draws in viewers. He is, also, likely a good resource for a young player looking for a grass court consult. But, he threatens to cheapen both endeavors by not drawing appropriate lines between them. There are plenty of others who have consulted with players between tournaments (Darren Cahill as part of the Adidas program, for example), whose commentary hasn’t suffered as much scrutiny afterwards. Perhaps it’s because of McEnroe’s higher profile that we are noticing this conflict over the others, but it’s for that reason that McEnroe should reconsider this the next time it rolls around.